A new wave of mega projects in Saudi Arabia are set to fuel major growth in the Kingdom’s US$3 billion interior design market. Real estate developments with a combined value of US$146 billion, including massive mixed-use projects such as King Abdullah Economic City, have created enormous business opportunities for interior design professionals flocking to INDEX Saudi, the new three-day trade event being launched next week. Opening its doors from 30 October to 1 November, INDEX Saudi will host more than 100 exhibitors and thousands of brands at the Riyadh International Convention and Exhibition Centre. Jaafar Shubber, Event Director for INDEX Saudi, said: “Inspired by the Kingdom’s Vision 2030, we’re seeing a number of large-scale real estate projects that focus on developing different segments of society, improving available facilities and infrastructure. Among the features of the show will be a free to attend CPD certified training sessions which will focus on the management, durability and profitability of interior design projects. On each day of the event three unique training sessions will be delivered by an industry expert. A line-up of speakers including H.E. Faisal Alfadl, Secretary General of the Saudi Green Building Forum and Mohammad Amjad, CEO at High Rays Contracting Company will deliver their keynotes and training to an audience of delegates. 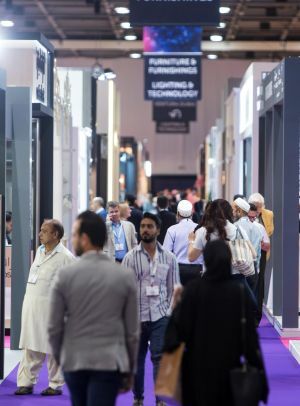 Hundreds of international product manufacturers and interior design firms are confirmed to take part in INDEX Saudi including Al Yamama Factory for Wooden Furniture, International Timber Company Ltd. (ITCO), International Company for Furniture, Tanatel, +Object, Sleep Nice, Gift Mart, Taxiat Trading Co and Mineheart. The show will attract thousands of interior designers, architects, project managers, retail buyers, importers and distributers from the full spectrum of hospitality, residential, retail, educational and commercial design, and take place at a time when designers are looking to ensure their projects stand out in the crowd. To register and attend for free, please visit: www.index-saudi.com.